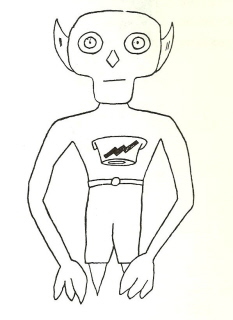 Let’s talk about the Flatwoods Monster one more time. This is a case, because of its high strangeness, that is easy to dismiss. A flying saucer landing on a hill with some kind of floating creature coming from it. One that might have had glowing eyes or one that might have "shot" rays from its eyes. Something that might have left landing traces that no one bothered to document at the time. And one in which the craft and creature disappeared before the corroborating witnesses could get there to take a look around. And one that I found difficult to believe because one of the researchers, Frank Feschino, had posted on a web site a quote attributed to me about his book claiming that the Air Force had engaged in combat with the flying saucers after an order had been given to "Shoot Them Down." What have we learned in the last week. The webmaster, Alfred Lehmberg, came forward and said that Feschino had nothing to do with that mistake. Lemberg said that he had taken the quote from a closed discussion group and attributed it to me because I had started the specific thread. Someone else, posting a comment to that thread had made the comment and Lehmberg didn’t pay close attention to the attribution. An honest mistake, he said. I can live with that. People make mistakes in attribution. What this also means is that Feschino had nothing to do with the misidentified quote. What it also means that one of the reasons to reject the information in his books has been eliminated. You might find his work sloppy or that he leapt to conclusions, but you can’t say he was responsible for the misidentified quote. That belongs to Lehmberg and he has taken complete ownership of it. Where does that leave me on the question of the Flatwoods Monster. Well, in this world, in which it would be nice to be invited to speak at all these conventions, where it would be nice to have others buying the books that I write, I find it difficult to say something or embrace something in which I have doubts. If I embraced everything... abductions, cattle mutilations, crop circles, every strange and bizarre UFO story... then I would find myself on lots of convention programs. But I just can’t do that. I have to believe what I say about the topic and with the Flatwoods Monster, I have difficulty embracing the tale as told. It seems that the bolide explanation for the sighting is reasonable. It seems that the hysteria of the witnesses contributed to their sighting. It seems that, by September, 1952, with the newspapers filled with stories of flying saucers, reasonable to believe that the idea of alien visitation wasn’t all that far from the minds of the witnesses. It all seems a reasonable explanation to me. But Frank Feschino has found some interesting information. I do not know why an officer in the National Guard would talk about deploying soldiers into the area. Deployment of National Guard forces is strictly controlled, if for no other reason than purposes of pay. An officer can’t order his soldiers into the field unless there is imminent loss of life and then he better have some very persuasive evidence. So, I suppose as some say, this would be in my gray basket (though I dislike that term) but it would be a very light gray. I don’t believe there is much of substance here, but it never hurts to take a closer look. Sometimes I find that I have been mistaken... but only sometimes. Since I was asked about this case, I thought that I would review it and see where we are on it today. I will tell you that the first thing I found was a web site promoting a book about the case (or the follow on book that is an outgrowth of this case as seen here) that I hadn’t read, though I knew about it. I wouldn’t have mentioned this, but the first thing I saw was a quote, from me, endorsing the book, using language that I wouldn’t use and failing to identify me as a retired Army officer. Given this, I’m more than a little concerned about the validity of anything that appears in the book, or the research that produced it. Using me to endorse the book when I did no such thing suggests someone who is less than candid in other areas of research. The only question is who is responsible for the quote and why was it even put up. I’ll have more on this in a later post. 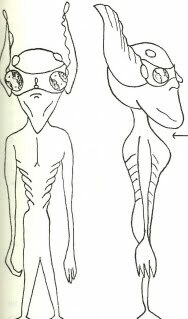 The Project Blue Book files contain very few cases in which alien creatures were reported. The most famous example is the Lonnie Zamora sighting from Socorro, New Mexico in 1964, which, in a twist for the Air Force was labeled as "Unidentified." For this discussion, we’ll let that go and look at another of the Blue Book cases, although, according to a letter in the files, "the incident has never been officially reported to the Air Force, [and] it has not taken official cognizance of the matter." What that letter, dated 29 Aug 1957 referred to was a landing and an attack by aliens near the small town of Hopkinsville, Kentucky a few days earlier. A group of people there were confronted by very strange, alien creatures (Illustration based on witness statements seen here). The Air Force would create an "information" only file about the case and ask a couple of officers to "look into it." Two years later, as questions began to be asked, the Air Force would initiate a short investigation but apparently only so they would be able to answer questions about an investigation, rather than actually attempt to learn anything about the sighting. The story officially began early on the evening of August 21, 1955, when Billy Ray Taylor, a young friend of Elmer "Lucky" Sutton, had gone to the well behind the farmhouse, and came running back telling all that he had seen a flying saucer. The object, described as bright with an exhaust that contained all the colors of the rainbow, passed above the house. It continued over of the fields, finally came to a hover, and then descended, disappearing into a gully. No one in the Sutton house, including Glennie Lanford, Lucky Sutton, Vera Sutton, John Charley (J.C) Sutton, Alene Sutton, three Sutton children, June Taylor and O.P. Baker, believed the story of the flying saucer. None of them considered walking out to the gully to see if something might be down there. The whole idea was preposterous. Not long after Taylor told his tale, the dog began to bark. Taylor and Lucky Sutton went to investigate that, but the dog ran under the house, not to reappear that night. Out in the fields, away from the house, was a strange, hovering glow. As it approached, they could see a "small man" inside it. He was about three and a half feet tall, with a large head that looked to be round, and long, thin arms that extended almost to the ground (Seen here). The creature's hands were large and out of proportion with the body, and were shaped more like a bird's talons than a human hand. The two eyes were large and seemed to glow with a yellow fire. As the creature continued to move toward the house, the two men retreated, found a rifle and a shotgun inside, and then waited. When the creature was within twenty feet of the back door, both men fired at it. The creature flipped back, regained its feet and fled into the darkness. The two men watched for a few minutes, searching for the creature and then walked into the living room where the others waited. The creature, or one just like it, appeared in front of one of the windows and the men shot at it, hitting it. This one also did a back flip and disappeared. Now the men decided it was time to go out to learn if they had injured or killed the creature, or animal, or whatever it was. Taylor was the first out, but stopped on the porch under a small overhang. A claw-like hand reached down and touched his hair. Alene Taylor grabbed him to pull him back into the house. Lucky, pushed past him, turned and fired up, at the creature on the roof. It was knocked from its perch. Someone, probably Taylor, shouted, "There's one up in the tree." Both Taylor and Lucky shot at it, knocking if from the limb. But it didn't fall to the ground. Instead, it seemed to float. They shot again, and it ran off, into the weeds. At the same moment, another of the creatures appeared around the corner of the house. It might have been the one that had been on the roof or one of those seen in the backyard. Lucky whirled and fired. The buckshot sounded as if it hit something metallic like an empty bucket. Just as had the others, the little creature flipped over, scrambled to its feet and fled, moving rapidly into the darkness. Having failed to stop the creatures with either the shotguns or the .22 caliber rifle, Lucky decided to leave them alone. Someone noticed that the creatures only approached from darkened areas. It seemed that they were repelled by the light. At some point they heard noises on the roof and went out the back door to investigate. One of the creatures was back on the roof. They shot at it, knocked it off the roof, but it floated to a fence some forty feet away rather than falling to the ground. Hit by another shot, it fell from the fence and ran away, seeming to use its arms to aid its locomotion. Some of the others in the house were still unconvinced that there were real creatures outside, believing instead, that the boys were playing some sort of a prank on them. With the lights in the house turned out, they had taken up a position close to one of the windows. Taylor told Lankford to wait and she would see for herself. After twenty minutes or so, one of the creatures approached the front of the house. According to Lankford, it looked like a five gallon gasoline can with a head on top of two thin, spindly legs. It shimmered as if made of bright metal. Lankford, who had been crouching quietly near the window for a long time, tried to stand, but fell with a thud. She shrieked in surprise and the creature jumped to the rear. Taylor fired at it through the screen door. About three hours after the first creature had been seen, about 11:00 that night, they decided it was time to get out. Everybody ran to the cars. One of the kids was screaming and had to be carried. They all raced to the Hopkinsville police station for help. At the police station, there was no doubt that the people have been frightened by something. Police officers, and the chief, interviewed after the events, made it clear they believed the people had been scared by something. That doesn't mean they were "attacked" by strange little metallic men, but does mean they were relating what they believed to be the truth to the assembled police officials. Within minutes, the police were on their way back to the house, with some of the Sutton men in the cars. The police also called the Madisonville headquarters of the Kentucky State Police. A call was even made to the chief, Russell Greenwell at home. He was told that a spaceship had landed at Kelly. Greenwell then told the desk sergeant that it had better not be a joke. There were now Kentucky State Police, local police, the Chief, and a sheriff's deputy either heading out to the Sutton house, or already there. One of the state troopers, who was only a few miles from Hopkinsville, on the road to Kelly, said that he saw what he called several meteors flash over his car. They moved with a sound like artillery, and he looked up in time to see two of them. They were traveling in a slightly descending arc, heading toward the Sutton house. The yard around the Sutton house was suddenly filled with cars, and more importantly light. The men tried to point out where the various events had taken place. The chief searched for signs that anyone or everyone had been drinking but found nothing to indicate that anyone had even a beer. Glennie Lankford later said that she didn't allow alcohol in the house. Once the police arrived, the situation changed radically. Although the atmosphere was tension charged, and some of the police were nervous, they began to search for signs of the invasion from outer space. There were apparent bullet and shotgun blast holes in the screens over the windows, and there was evidence that weapons had been fired, but there were no traces of the alien creatures. The hard packed ground did not take footprints. The search of the yard and fields around the house revealed little, except a luminous patch where one of the creatures had fallen earlier and was only visible from one angle. The chief said that he saw it himself and there was definitely some kind of stain on the grass. There is no evidence that anyone took samples for analysis later. But with no real evidence to be found, with no alien creatures running around, and with no spacecraft hidden in the gully, the police began to return to their regular, mundane duties. By two in the morning, only the Suttons were left at the house. A half an hour or so after the last of the police left, and with the lights in the house down, Glennie Lankford saw one of the creatures looking in the window. She alerted her son, Lucky, who wanted to shoot at it, but she told him not to. She didn't want a repeat of the situation earlier in the night. Besides, the creatures had done nothing to harm anyone during the first episode. But Lucky didn't listen to her. He shot at the creature but the shot was no more effective than those fired earlier in the night. Other shots were fired with no apparent affect. The little creatures bounced up each time they were hit and then ran away. The little beings kept reappearing throughout the night, the last sighting occurring just a half an hour before sunrise. That was the last time that any of the beings were seen by any of the Suttons or their friends. Although it seems that military personnel, from Fort Campbell, Kentucky, did visit the Sutton house, and interviews with the witnesses were conducted in 1955, an investigation by the Air Force didn't take place until two years later. According to Project Blue Book files, apparently, in August, 1957, prior to the publication of a magazine article that would review the case, someone in the Air Force decided they should "investigate." In a letter from the ATIC at Wright-Patterson, to the commander of Campbell Air Force Base, Wallace W. Elwood wrote, "1. This Center requests any factual data, together with pertinent comments regarding an unusual incident reported to have taken place six miles north of Hopkinsville, Kentucky on subject date [21 August 1955]. Briefly, the incident involved an all night attack on a family named Sutton by goblin-like creatures reported to have emerged from a so-called 'flying saucer.'" Later in the letter, Elwood wrote, "3. Lacking factual, confirming data, no credence can be given this almost fantastic report. As the incident has never been officially reported to the Air Force, it has not taken official cognizance of the matter." Here, once again is the Air Force attitude that if the case has not been reported to them, then it simply doesn’t exist. The matter was apparently assigned to First Lieutenant Charles N. Kirk, an Air Force officer at Campbell Air Force Base. He apparently spent about six weeks investigating the case before sending the material on to ATIC on October 1, 1957. He researched the story using the Hopkinsville newspaper from August 22, 1955 and September 11, 1955. He also had a letter from Captain Robert J. Hertell, a statement from Glennie Lankford, one of the witnesses, and a statement given to Kirk by Major John E. Albert about his involvement in the case, and a copy of an article written by Glennie Lankford. Albert's statement provides some interesting information. Remember, the Air Force was claiming that the case had not been officially reported and therefore the Air Force had not investigated. It seems that here we get lost in the semantics of the situation and the question that begs to asked is, "What the hell does all that mean?" It sounds like a police officer who, seeing a robbery in progress, then ignores it because it hadn't been reported to the station and he wasn't dispatched by headquarters. A police officer can't ignore the crime and it seems reasonable to assume that the Air Force shouldn't have ignored the story. The sighting was outlined in the media including the radio broadcasts, and newspapers from various locations around the country were reporting what had happened. Although the Air Force officers at Blue Book or ATIC must have known that the sighting had been made, they chose to ignore it. If the sighting wasn't reported through official channels, directly to them, then it simply didn't exist. Since no one reported this case through official channels, the sighting could be ignored. Or was it? Lieutenant Kirk, in his report in 1957, sent a copy of the statement made by Major John E. Albert on September 26, 1957, to ATIC. The very first paragraph seems to suggest that notification was made to Campbell Air Force Base which should have, according to regulations in effect at that time (1955), reported it in official channels, to ATIC and therefore Blue Book. The regulation is quite clear on the point and it doesn't matter if everyone in the military believed the sighting to be a hoax, or if they thought the sighting too outrageous, it should have been investigated because the regulations required it. That investigation would not have been conducted by ATIC and Project Blue Book but by the 4602d Air Intelligence Service Squadron. AFR 200-2 tells us exactly what should have happened to the report. It went on to the 4602d and apparently disappeared into some bureaucratic limbo there. In the statement found by Kirk, Albert said, "On about August 22, 1955, about 8 A.M., I heard a news broadcast concerning an incident at Kelly Station, approximately six miles North of Hopkinsville. At the time I heard this news broadcast, I was at Gracey, Kentucky, on my way to Campbell Air Force Base, where I am assigned for reserve training. I called the Air Base and asked them if they had heard anything about an alleged flying saucer report. They stated that they had not and it was suggested that as long as I was close to the area, that I should determine if there was anything to this report. I immediately drove to the scene at Kelly [for some reason the word was blacked out, but it seems reasonable to assume the word is Kelly] Station and located the home belonging to a Mrs. Glennie Lankford [again the name is blacked out], who is the one who first reported the incident. (A copy of Mrs. Lankford's statement is attached to this report)." Deputy Sheriff Batts was at the scene where this supposedly flying saucer had landed and he could not show any evidence that any object had landed in the vicinity. There was nothing to show that there was anything to prove this incident. Mrs. Lankford was an impoverished widow woman who had grown up in this small community just outside of Hopkinsville, with very little education. She belonged to the Holly Roller Church and the night and evening of this occurrence, had gone to a religious meeting and she indicated that the members of the congregation and her two sons and their wives and some friends of her sons', were also at this religious meeting and were worked up into a frenzy, becoming emotionally unbalanced and that after the religious meeting, they had discussed this article which she had heard about over the radio and had sent for them from the Kingdom Publishers, Fort Worth 1, Texas and they had sent her this article with a picture which appeared to be a little man when it actually was a monkey, painted silver. This article had to be returned to Mrs. Lankford as she stated it was her property. However, a copy of the writing is attack to this statement and if it is necessary, a photograph can be obtained from the above mentioned publishers. It is the third paragraph, however, that is filled with things that bear no resemblance to reality. Lankford was not a member of the Holly Rollers, but was, in fact a member of the Trinity Pentecostal. Neither she, nor any of the family had been to any religious services the night of the "attack." This unsubstantiated allegation was made in a recent book, suggesting, once again, that the religious tone of the family had somehow contributed to the attack on their house. Or rather, that they were "hysterical" people who would see things that simply were not there. And, Lankford couldn't have heard about any "article" from the newspapers or magazines as it was read on the radio because there was no radio in the farm house. And there was no evidence that Lankford ever sent anywhere for any kind of article about flying saucers and little creatures, those painted silver or any other color. In other words, Albert had written the case off as a hoax, almost before he began his "investigation" because of his false impressions. Apparently he was only interested in facts that would allow him to debunk the case and not learning what had actually happened. I have to say, at this point, I would have been quite skeptical of this tale. It is outrageous and beyond belief, but then, things we do today would have been thought of as outrageous and beyond belief fifty years ago. So, we approach with a skeptical attitude, but we listen to what the witnesses have to say and look for ways to corroborate their statements. Further evidence of the investigators attitude is provided in the next paragraph of his statement. "It is my opinion that the report Mrs. Lankford or her son, Elmer Sutton [name deleted but it is reasonable to assume it was Elmer Sutton], was caused by one of two reasons. Either they actually did see what they thought was a little man and at the time, there was a circus in the area and a monkey might have escaped, giving the appearance of a small man. Two, being emotionally upset, and discussing the article and showing pictures of this little monkey, that appeared like a man, their imaginations ran away with them and they really did believe what they saw, which they thought was a little man." It is interesting to note that Albert is not suggesting that Lankford, the Suttons, and the Taylors (other members of the family present that night) were engaged in inventing a hoax. Instead, with absolutely no evidence, Albert invented the tale of an escaped monkey that fooled the people. That does not explain how the monkey was able to survive the shots fired at it, especially if it was as close to the house as the witnesses suggested. In other words, with shotguns and rifles being fired, someone should have hit it and there should have been broken bits of monkey all over the farm land. And, remember, the various witnesses talked of a number of little men, not a single individual. But Albert wasn't through with the little monkey theory. "The home that Mrs. Lankford lived in was in a very run down condition and there were about eight people sleeping in two rooms. The window that was pointed out to be the one that she saw the small silver shining object about two and a half feet tall, that had its hands on the screen looking in, was a very low window and a small monkey could put his hands on the top of it while standing on the ground." The final sentence said, "It is felt that the report cannot be substantiated as far as any actual object appearing in the vicinity at that time." It was then signed by Kirk. What is interesting is that Albert, and then Kirk, were willing to ignore the report of the object because there was nothing to substantiate it, other than the witness testimony that there had been an object. Both Albert and Kirk were willing to buy the monkey theory, though there was nothing to substantiate it either. They needed a little man, of at the very least, a little humanoid creature for the family to see and they created one because a "monkey might have escaped." Glennie Lankford might have inspired the little monkey story with her own words. In a handwritten statement signed on August 22, 1955, said, "My name is Glennie Lankford age 50 and I live at Kelly Station, Hopkinsville Route 6, Kentucky. On Sunday night Aug 21, 55 about 10:30 P.M. I was walking through the hallway which is located in the middle of my house and I looked our the back door (south) and saw a bright silver object about two and a half feet tall appearing round. I became excited and did not look at it long enough to see if it had any eyes or move. I was about 15 or 20 feet from it. I fell backward, and then was carried into the bedroom. My two sons, Elmer Sutton aged 25 and his wife Vera age 29, J.C. Sutton age 21 and his wife Aline age 27 and their friends Billy Taylor age 21 and his wife June, 18 were all in the house and saw this little man that looked like a monkey. So the Air Force, which, of course, didn’t investigate sightings of creatures at the time, seized on her description and turned it into a possible solution, suggesting, with no justification that the Suttons had been attacked by a horde of monkeys which were immune to shotguns. They overlooked the evidence of the case, or ignored the testimony, dispatched someone to look into it unofficially at the time, and then denied that they had ever investigated. And there might have been. Back in 1955 there were only a few nuclear stockpiles in the world and one of them was at Campbell Air Force Base, not all that far from Hopkinsville. Could it have been that some high-ranking Air Force general, who knew what was stored so close to this alien invasion site, wanted the story buried, not because of the alleged little creatures but because he didn’t want a lot of reporters in the area asking a lot of questions that might compromise an atom secret. No, the storage of the weapons there has little to do with the story but the story focuses attention on the area. The Air Force, not one at the time to favorably entertain any UFO stories and especially those with creatures, didn’t bury the case because of the UFO connection, but because of the secret facility close by. Maybe radioactive monkeys that had been exposed to the atomic weapons after they escaped from that mythical circus that was in town... Hey, it would make a good movie and we could have a lot of fun with it. But that doesn’t answer the question about what happened that night. That’s just something we might never know. As I was putting the last poll together, I came at it from a believer’s perspective. The questions all suggested there was something to be Disclosed, meaning, of course, that there was alien visitation. A number of people have pointed out that those assumptions were flawed. There should have been a "Never" answer, and more importantly, a "Nothing to Disclose" answer. Because of that, I thought I would throw up another "Disclosure Poll," with those answers on it and see if I received significantly different results. they are running a similar poll. It will also be interesting to see how their results compare to mine. Their philosophy is somewhat different than mine so their readers will have a different perspective on the universe than we do over here. The results are in and not too surprising. More than half of the voters in this unscientific poll believed that Disclosure wouldn’t happen for years (that is 54 of the respondents or 56%). The next large bloc of votes (24 and 25%) thought there would be Disclosure, but it wasn’t coming soon. That means that more than three-quarters of the respondents don’t believe in Disclosure anytime soon. Fewer than ten voters (9 and 9%) thought that Disclosure was at hand. I don’t know why they’d believe this, given the history of this phenomenon. It’s been around, in the public consciousness for more than sixty years and at times it seems we are no closer to a resolution than we were at the very beginning. And the smallest group ( 8 and 8%) think Disclosure is coming soon. That’s a fairly vague term and is, of course, my fault. I should have defined what I meant by soon... which is sometime in about a year or so. Unless some outside force acts. By this I mean that the aliens land to tell the world they are here. In the world of secrecy you do not say that which you know to be classified to those not cleared to hear it, even if the secret is out and everyone knows it. You are still required to keep it a secret. This explains why sometimes you hear a government employee denying something that we all know is true. We are not cleared and he is going to obey the law about the disclosure of classified information. But once the aliens land further confirmation of their presence will not be required. We’ll all know the truth. Until then, we will continue to argue alien visitation. We will cite proof which the debunkers will reject based not so much on evidence as on their belief that aliens couldn’t reach here from there. The distances in space are too vast... and they will reject the proof available because they know there is no alien visitation and if there is no alien visitation there can be no proof. And yes, this is a little bit more supportive of the ETH than I wanted, but sometimes I just get tired of the arguments. Donald Menzel says that the Lubbock Lights photographs are a hoax because there is no other answer except ETH... Phil Klass rejected McMinnville because it was either alien or a hoax and since there are no aliens, it must be a hoax. Disclosure is a different matter. There were those, in the 1950s, who believed the government was preparing us for Disclosure with the release of The Day the Earth Stood Still. Others believed, in 1977, Disclosure was at hand with the release of Close Encounters of the Third Kind. In the world today, there isn’t that sort of movie tradition, though science fiction films that deal with alien invasion, alien visitation and alien reality do very well at the box office (It’s amazing to me that the Oscars have not recognized how well science fiction does with everyone but the pretentious voters who claim they don’t watch science fiction, but I digress). So, barring some extraordinary event outside the capability of the government to control, there will be no Disclosure. Those on the outside think that throwing rocks at the glass house of UFO secrecy will eventually work. Unfortunately, the glass is bullet proof and the rocks bounce off.